This stunning paperweight is made from the finest solid, crystal clear acrylic with a rich copper finish applied to the back. 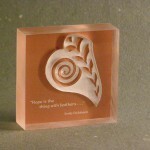 Our Leaf Symbol is deeply laser etched into the back of the acrylic block for a rich feel and look. 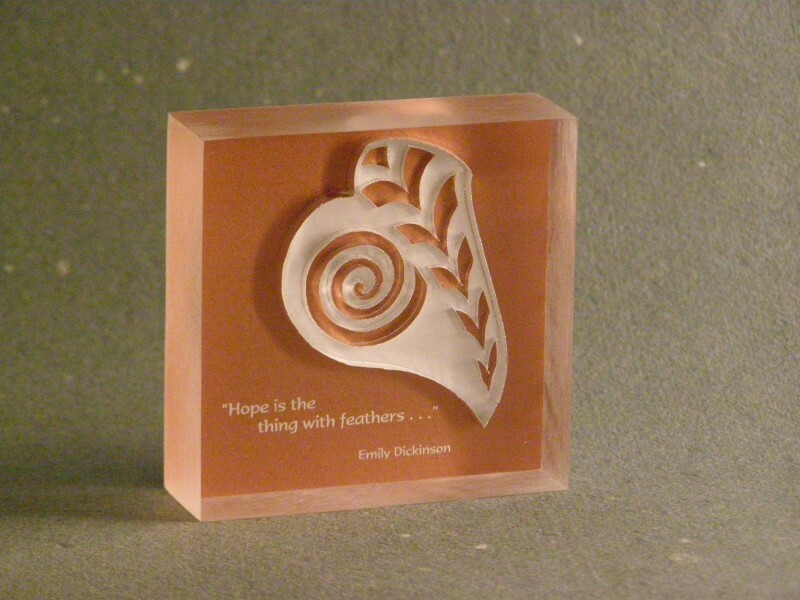 The meaningful quote is the beginning line from Emily Dickinson’s famous poem about hope: “Hope is the thing with feathers . . .” Measuring 4” wide x 3” tall x 3/4” deep this paper weight has a satisfying heft and feel. Use it as a true paperweight at your desk or a lovely object of art sitting on a windowsill or bedside table to catch the morning light. Either way, it is a lovely reminder to keep hope close at hand.